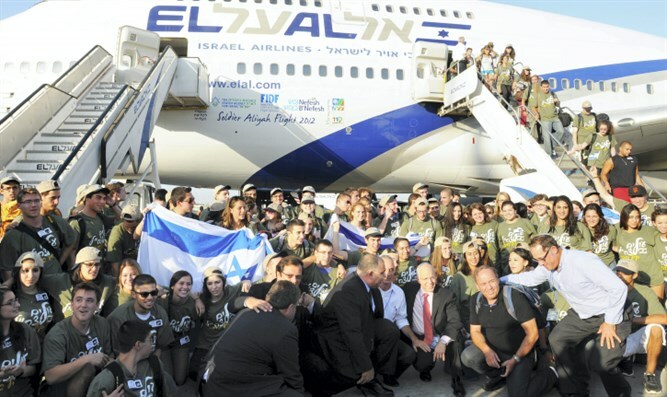 The second summer flight of Nefesh B'Nefesh has landed in Israel. Arutz Sheva covers the event. 233 North Americans arrived today in Israel on an El Al Boeing 777 chartered by NefeshB’Nefesh, to make aliyah (immigrate to Israel). The flight was facilitated in cooperation with Israel’s Ministry of Aliyah & Immigrant Absorption, the Jewish Agency for Israel, Keren Kayemeth Le’Israel (KKL), JNF-USA and Tzofim-Garin Tzabar. The passengers included 75 young men and women who will become Israeli citizens and volunteer in the Israel Defense Forces (IDF). They are moving to Israel as ‘Lone Soldiers’, youngsters who left their families in the US and Canada to move to Israel and volunteer for the Israeli Army. They will join the over 900 Lone Soldiers from the US, and the 3,000 Lone Soldiers from around the world who are currently serving in the IDF. The flight’s other passengers included a diverse mix of people from 22 US states and one Canadian province, including 24 families, 78 children and 10 medical professionals. Ages of the immigrants range from 3.5 weeks to 85 years old. With this flight, NBN celebrated its 50,000th immigrant brought to Israel via the organization, which was founded in 2002. A special welcome ceremony was held at Ben Gurion Airport upon the flight’s arrival which included: President of the State of Israel Reuven Rivlin; Minister Tzachi Hanegbi; Minister of Immigrant Absorption, MK Sofa Landver; Director of the Aliyah, Absorption and Special Operations Unit of the Jewish Agency for Israel, Yehuda Sharf; Chairman of Garin Tzabar, Eli Ben Yosef; and Co-Founders of Nefesh B’Nefesh, Rabbi Yehoshua Fass & Tony Gelbart.